A rare, Monday evening show at the historic Sons of Hermann Hall. While I’m definitely stepping out of my realm by booking an Americana/singer-song writer oriented show, but sometimes you need to book for the venue and not yourself. This being a really solid show for long-term patrons of SONS OF HERMANN HALL. 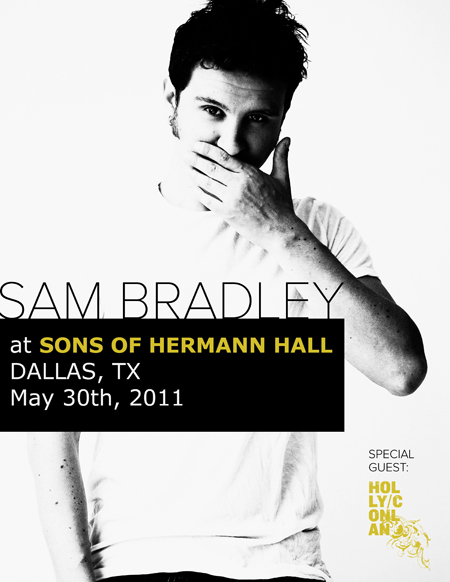 Sons are trying to raise money for a new roof during their Centennial celebrations in April; so here is a perfect show to help support the oldest venue in Dallas, UK/Canadian based SAM BRADLEY. He played House of Blues last November and has had multiple stops in Dallas over the past few years. on sale here and at good records. This entry was posted on May 30, 2011 at 7:07 am, filed under News.